Since 1994 Precision Hygiene have been supplying premium catering hygiene products to the hospitality industry. In 2004 Precision launched the Spoonshine brand of cutlery polishing machines into the UK market, and very quickly established the brand as the market leader, securing contracts with independent and multiple end users alike. For nearly ten years now Spoonshine, from Precision Hygiene have been a regular fixture at trade shows up and down the country. This award winning machinery continues to ‘shine’ amongst its peers, with its ‘dual sanitisation’ functionality and a warranty that can extend to five years. In conjunction with their manufacturing partner, Precision Hygiene launched the ‘Wineshine’ glass polisher, yet another fabulous labour saving and performance enhancing product that helps to ease the burden of delivering sparkling clean glassware to discerning guests of the hospitality industry. During the economic downturn, Precision has continued to maintain their position as the leading supplier of these products, and have been working closely with their manufacturing partners to develop new products that will also revolutionise the world of Food Service. Precision have also forged a strong alliance with the market leader for ware washing and now can offer Hobart Dishwashers and ancillaries at competitive prices via the dedicated website: www.hobartdishwasher.co.uk. Staying true to their roots, Precision of course continue to develop their range of premium dishwash detergent and hygiene chemicals which are easily available to order online, over the telephone, or via their sales team. Precision Hygiene believe that 2013 is the year that will see our country emerge strongly from the downturn, and are positioning themselves for this with the broadest product offer that they have ever had. We have built our reputation over the years by providing the hospitality industry with a number of quality products enabling caterers to maximise hygiene and front of house presentation whilst minimising expenditure. Precision Hygiene supply the market leading Hobart Independent ranges of Bar Aid and Ecomax dishwashers and glasswashers at www.hobartdishwasher.co.uk. View the range of labour and cost saving Cutlery Polishing machines at www.spoonshine.co.uk. View the labour and cost saving Glass Polishing machines at www.wineshine.co.uk. 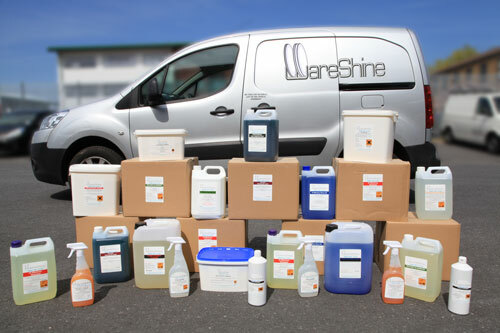 Dishwashers, Glasswashers, Cutlery Polishers, Glass Polishers and Hygiene Chemicals are all also available at our www.wareshine.co.uk website. Details of the new range of catering equipment from Precision Hygiene will be made available shortly. Precision Hygiene supply a comprehensive range of chemicals through both their Wareshine and Hobart Dishwasher websites including rinse aid, dishwash, detergent, oven cleaner, bleach, disinfectant, scouring powder, air freshener, rejuvinate, steamer cleaner, steamer shiner, sanitising powder and toilet cleaner. We don't share this info with anyone else and won't bombard you with spam. We'll just get back to you as soon as possible to help with your enquiry.